One of our favorite on-going fundraisers comes to us courtesy of Cowdance Soap. These elegant handmade and hand cut soaps, wrapped in our CADPA logo, are made of the finest natural ingredients and beautifully scented. Almost 50% of each purchase supports the Carlisle Dog Parks Association. They make wonderful gifts-- and be sure to buy a couple for your own home, as well! You, your family and your pets can be a permanent part of the Carlisle Dog Park with a commemorative brick! Print and complete the order form, below. Did you know that your clothing donations can benefit the Carlisle Dog Park? 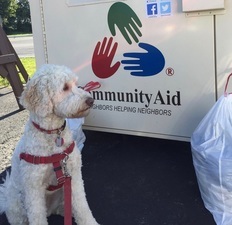 Proceeds from the sale of each pound of clothing collected from the Community Aid bin outside of Knisely's Pet and Farm Center benefit CADPA! The bin is located at 1025 Ritner Highway, in Carlisle. What an easy and convenient way to help!